“Could you freestyle something?” asks a participant pointing to the microphone next to the mixer. 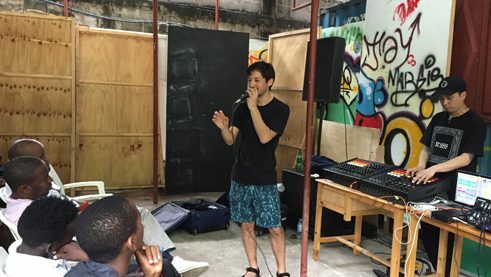 For an hour, the band Symbiz has been holding a beat workshop in Dar es Salaam. The two band members show how to mix and refine beats on a small laptop screen. Twenty young musicians from Dar es Salaam are seated in front of them on plastic chairs listening to the interpreter translate from English to Swahili. The rain is pattering on the corrugated iron roof, mosquitoes are whirring through the air, while the participants’ attention is whirring away with them. “Could you maybe play a song so that we can get to know your music?” asks another participant. 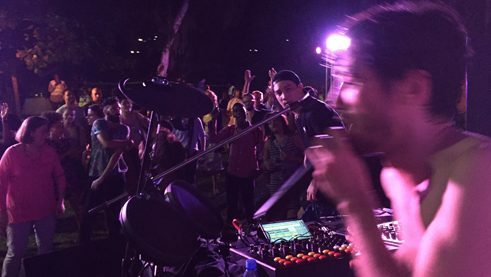 The two band members look at each other. The singer Zhi Yang Trieu takes the mic and quietly begins to sing the chorus of one of their songs. The beat producer Sebastian Meyerholz pushes the slider up and the bass resounds from the speakers. Already, the others have leapt up, clapping in time, filming with their cell phones. Two Tanzanian rappers walk to the front and take turns rapping the beat they are hearing for the first time. Singer Trieu accompanies them on the chorus. Suddenly it’s as though they are speaking the same language.